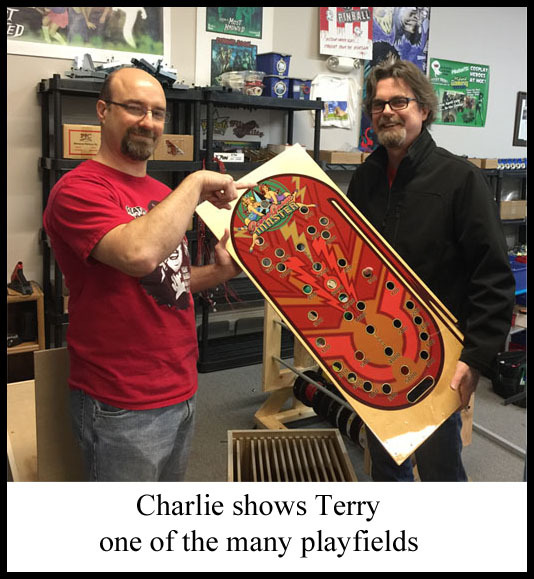 Dino and I hit the road the first thing in the morning, heading up to Spooky Pinball to pick up the SGM playfields and translite acrylics. It’s a pleasant 2 hour ride through northern Illinois and southern Wisconsin. 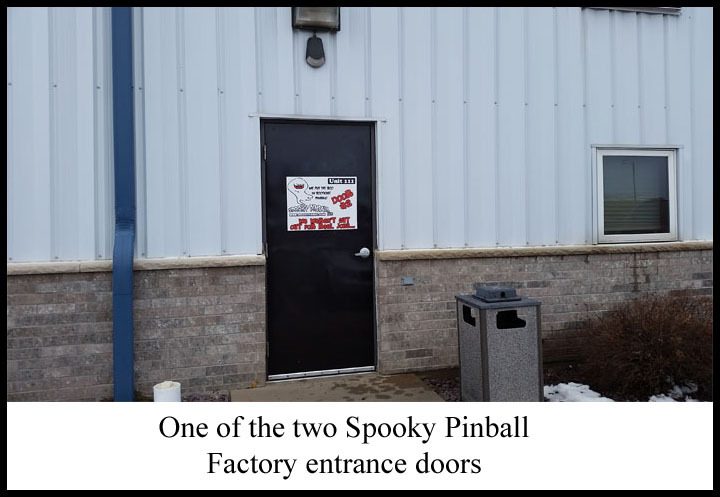 Spooky Pinball is located in the quaint little town of Benton. It looks and feels like it was pulled right out of Mayberry, R.F.D. We arrived to find Charlie and company hard at work making their current game, America’s Most Haunted. The tone was lively and upbeat, and Charlie was his usual charming self. 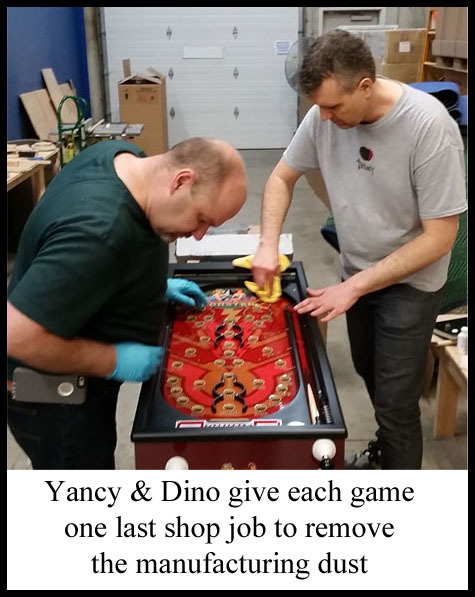 After a quick lunch with Charlie and KT at Laurence’s Pub & Eatery in downtown Benton, Dino and I headed back to Day One Pinball to meet up with the assembly crew for another night of factory work. There was plenty to do now that we had the playfields. 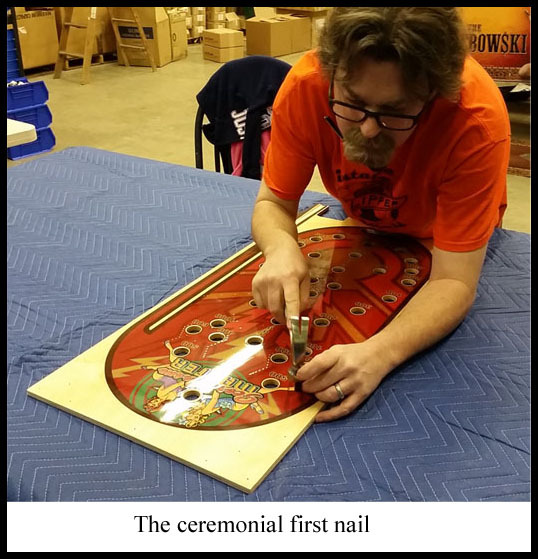 Each playfield has 104 nails that have to be individually hammered in. 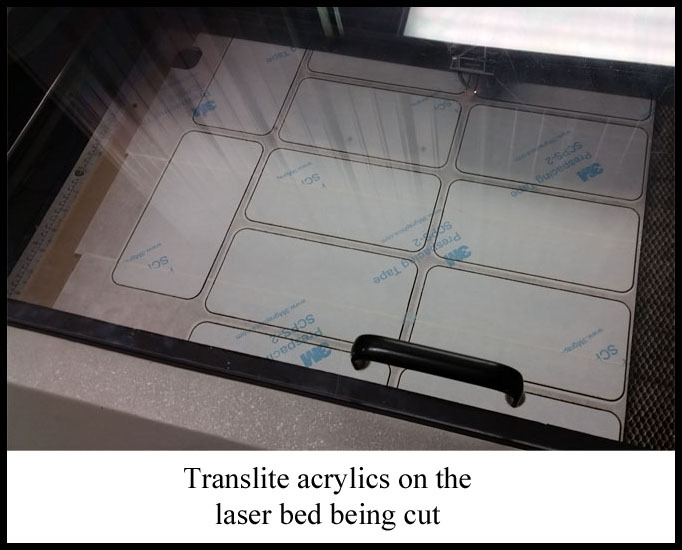 Alex 3D printed a small guide tool to help keep all the nails straight and at the same height. 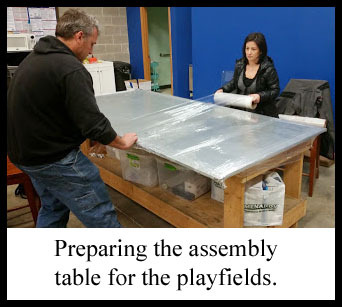 Jay and Margaret shrink wrapped an assembly table and everyone got to work. 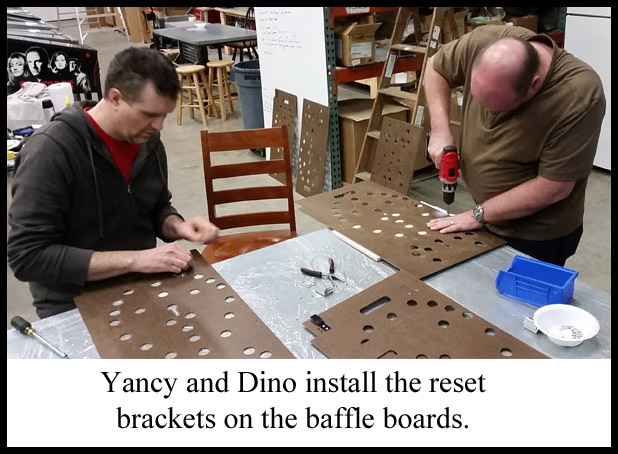 Paul from VirtuaPin drove down the same evening and dropped off the first 10 cabinets, lower playfield parts, and legs. 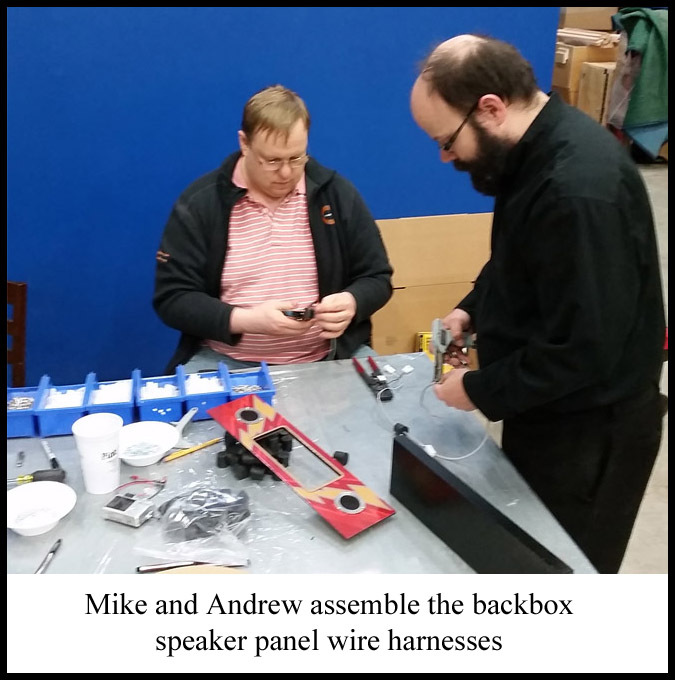 There was a lot of hand assembly work required in the final stages of the SGM build. 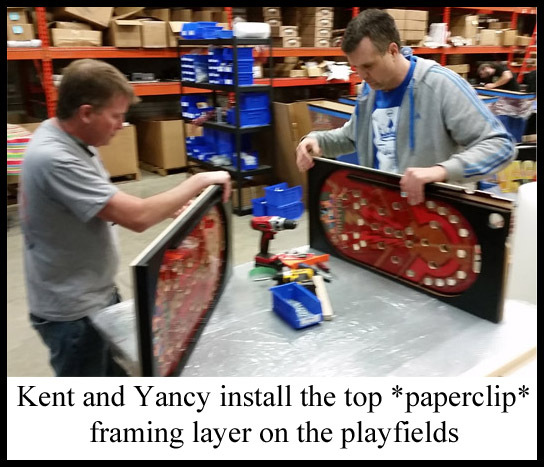 Besides the pounding in of all the playfeild nails, the *paperclip* needed to be installed onto the top of the main playfield. 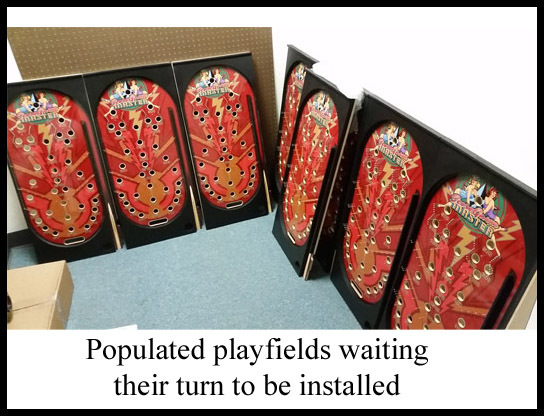 The reset playfield and the lower playfield needed to be attached to the bottom of the main playfield. 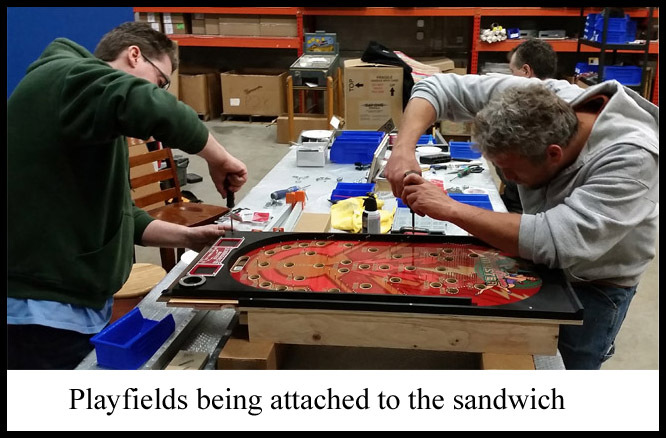 Once attached to the sleds, these 4 components came together into one assembly; the *playfield sandwich*. 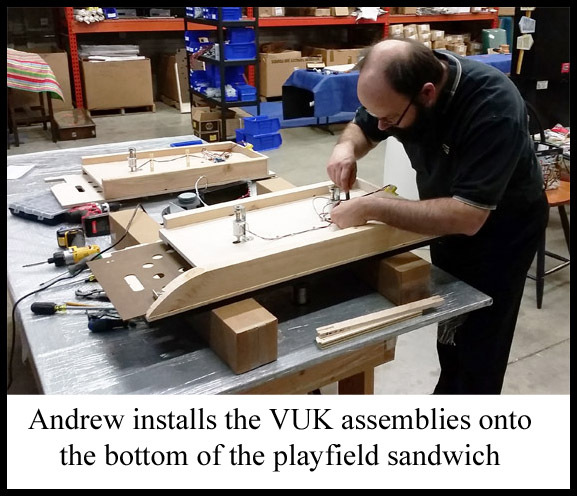 Once these were together, the VUK assemblies and the rollover switch assembly needed to be installed onto them and wired up. 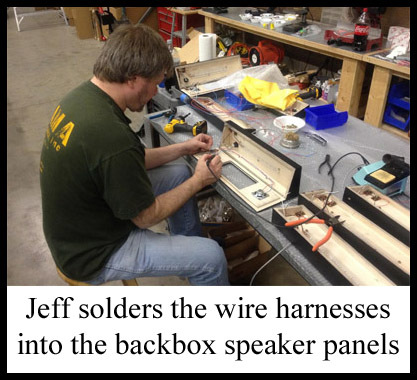 The backbox speaker panels also had to be assembled and their wire harnesses had to be made. 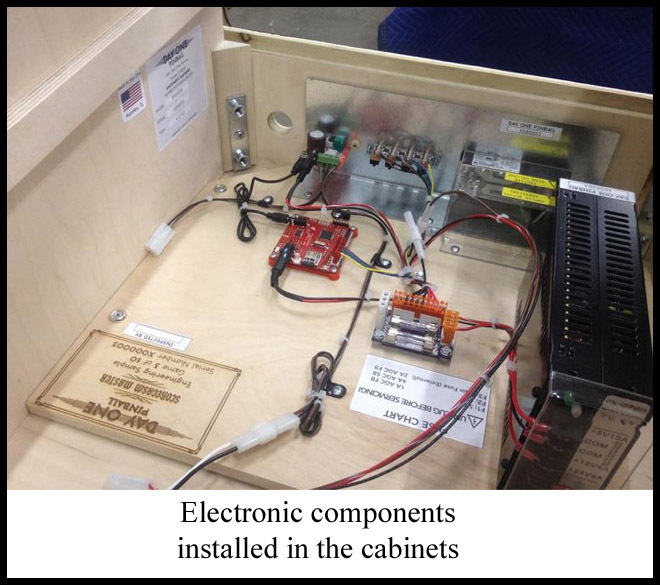 The shooter, reset, and lift mechanisms needed to be installed onto the cabinets. 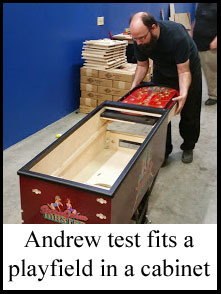 Finally, a last QC check off list had to be completed for each game before getting a final cleaning before being boxed up. 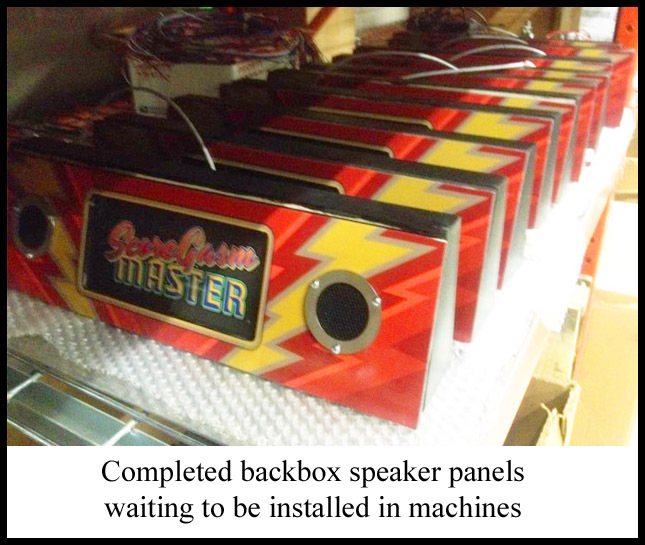 In short, a hectic mad dash for the finish line before the MGC (Midwestern Gaming Classic) debut on 04/10/15! 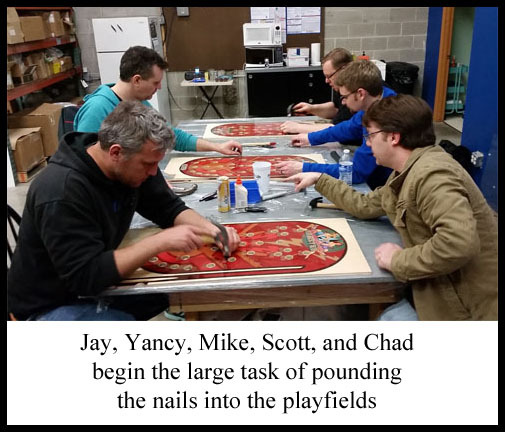 By Friday morning at 3am, April 10th, we had completed the engineering samples that were scheduled to be taken to MGC for the weekend. 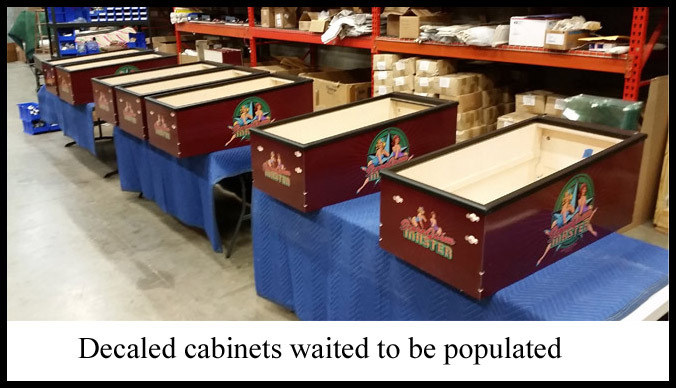 Everyone ran home and got just a few hours of sleep and then it was time to pack up the boxed machines and load them into the rental van for the trip. The game received hundreds of plays over the weekend and held up well. 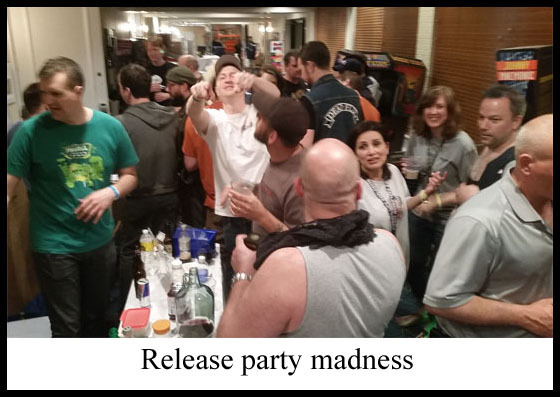 At the after party on Friday night a spontaneous ScoreGasm Master release party broke out at around midnight and didn’t end until 4am! After looking through a bunch of pictures from the event I could find only one picture that was usable here in this blog! Needless to say, it was an awesome party!